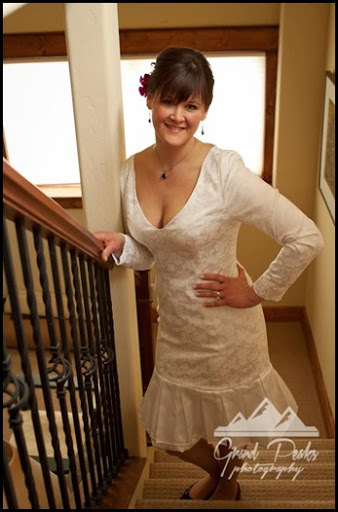 If you’ve been a guest of ours within the past 10 years, then chances are you’ll recognize this lovely bride. 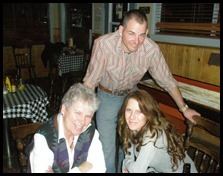 Nancy Short has been a part of our ranch family since 2003 when she moved to Colorado from Michigan and began with her position on our Crew staff. 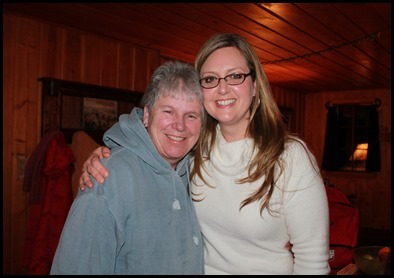 Her skills and work ethic quickly moved her up to our Lodge Hostess position, but Nancy had a desire to pursue other skills as well and after completing school in massage therapy, became the ranch’s first on-ranch massage therapist. And you can bet we knew how good we had it! Our guests who have traveled all over the world tell us they’d never had better. It was just this past year that Nancy decided to pursue yet another skill she has acquired (She’s multi-talented. What else can we say?) and has placed the “massage therapist torch” (What? It could be a ‘thing’—just trust me) into another’s very capable hands. We are sad we won’t be seeing her around the ranch as much, but we are thrilled for all of her new adventures and mostly we’re content because we know she’s still just up the hill and forever part of our ranch family! So this ranch family was thrilled when Nancy asked so many of us be part of a very special day for her. Nancy met Derek DuLac here in the small town of Parshall and after a beautiful friendship, they knew they wanted to spend their lives together. 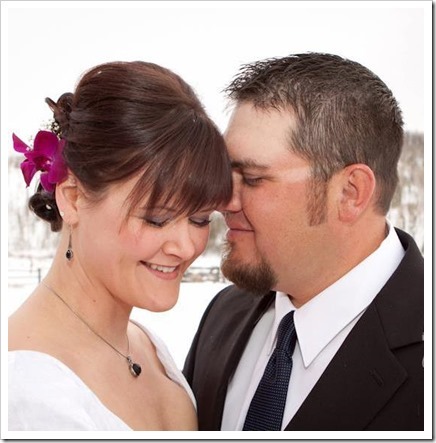 On the 23rd of February, they said their I Do’s in a small ceremony on a wintry Colorado day. And we don’t think a bride has ever shined like Nancy did! We are truly happy for them both. So how was the ranch part of their big day? Well…….YES! That is Jerry looking dashing in his cowboy suit. Didn’t know he was a minister as well? Neither did he! But Nancy and Derek asked him to conduct the ceremony. So here is something you may not know about our state. 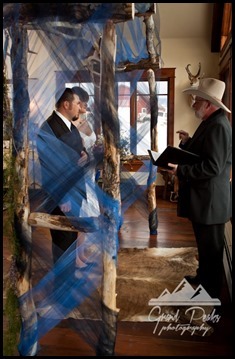 In Colorado, you can officiate your own wedding—it’s true! You simply do the paperwork beforehand and then you can ask whomever you’d like to speak and do the honors. They need no special title or license. And THAT is what Nancy and Derek did. Thus they were able to ask Jerry—whom, like so many of us, they love and respect—to do the honors. And honored he was! Look at this beautiful bride! Our very own Chef Eddie Allen prepared an exceptionally divine spread of food for the wedding guests. That man makes magic when he’s cooking! 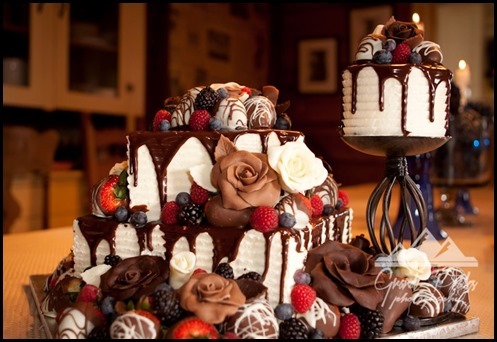 And ranch mama Tammy Yurich mixed art with cake to give the couple a beautiful wedding gift—chocolate roses and all! I’m starting to get hungry. Let’s move on…… Everything was fit for one perfectly matched couple! 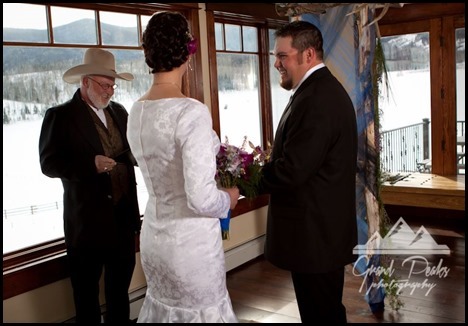 And thank you to Grand Peaks Photography for sharing these gorgeous pictures with our ranch blog! A beautiful, beautiful job! 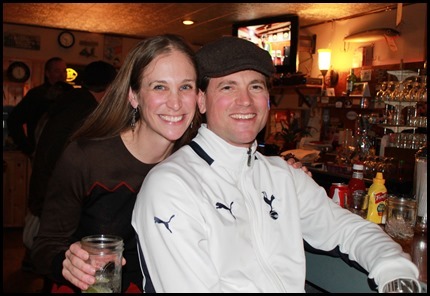 So what better place to have an after-party… than our beloved Parshall Inn! 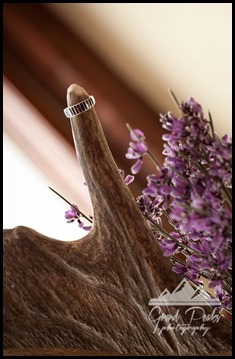 Over the years, dozens of staff have fallen in love with the area and put roots in the towns surrounding the Bar Lazy J. 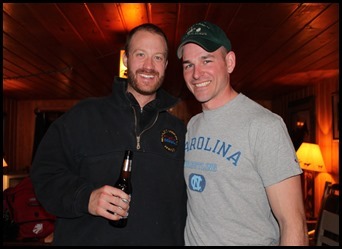 With a reason to pull us all together, it was a fantastic night of old friends and new beginnings. We had much to celebrate! Nat was our farrier for many years. 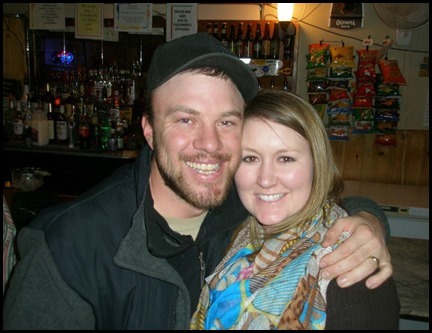 He met Emily when she worked Crew for us several years ago and they were married in 2011. Elisa worked several years for the ranch in various positions starting back in 1998. 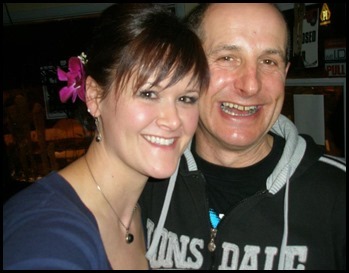 She, too, stayed in the area and she and her fiance Matt will be getting married this summer as well! (Are you noticing a trend here? 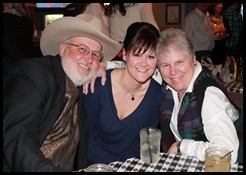 Me too…) Nancy and her “ranch parents”! 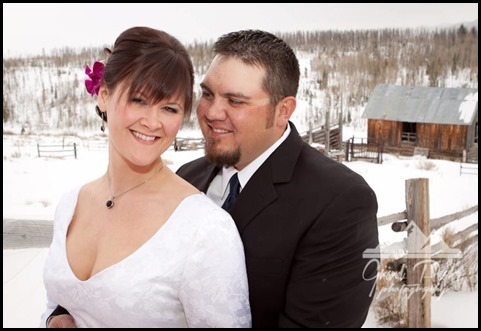 Cheri, Chad and Tammy—this couple also stayed after moving out to work on the ranch, met in 2003 and married in 2005! And by chance-- on this already wonderful weekend full of old friends and ranch family--there happened to be a few more who stopped by unrelated to all the festivities. They have impeccable timing! Richard is from England and comes yearly both in the summer and in the winter to enjoy the snowy side of things here in the county in addition to the beautiful summers. 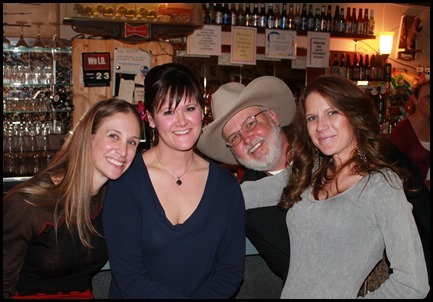 He has been our ranch guest for many, many years and like many of YOU, he is family to us. Recognize the fella on the left there below? Goose! No I’m not playing that duck game. That’s his name. Or at least that is how he will always be known on our ranch amongst our staff and guests. “Goose” is just a few months from graduating vet school in Ft. Collins and will be giving some of his time to the Army Reserves up in the Northwest part of the country. We were sure to have him fulfill all our veterinary needs before he left—because he owed us for that extra comforter we let him steal from the laundry room when he worked for us….. <keeping a straight face.> It was wonderful to see him and he’ll be visiting us again soon to bring his girl—perhaps on their honeymoon from what we hear….. AND the lovely Miss Christina you see here with Cheri, who was a first time ranch guest this past September, came for a few days to share her new love with some of her friends. We were delighted to see her and show off our wintry paradise to her and her friends-- Abbie and Libby. Although the ranch looks completely different in the winter, they caught that bit of magic everyone feels and all are planning their summer trip back. Although Christina’s may be a more permanent trip sooner than later (fingers crossed!) But be careful Christina. Based on our previous trend…………...you may never want to leave! (Did you think I was going to say something else?) Congratulations once again to our one and only Nancy Short/Tall-Pants-Dulac. 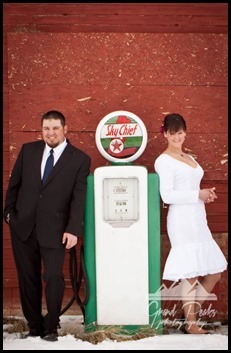 Thank you for letting Bar Lazy J be part of your big day! We love you and wish you and Derek all the happiness in the world. May your happy moments together number more than the stars here on a summer night. May your lives be colored like the sunsets. And may your love be as bright, clear and warm as a Colorado blue-skied day.